MyEDiary have partnered with Human Edge to provide our users with a much improved one-click export - import process for First Class data. Select 'MyEDiary' from the list and follow the prompts to save the exported data to your computer. Each of the files exported by First Class will be ready for importing into MyEDiary without further manipulation. 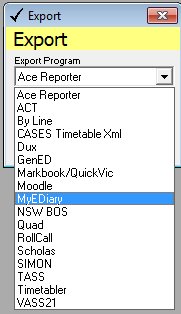 Within MyEDiary, go to Content > Import / Export and choose the relevant tab for the resource that you'd like to import. Follow the instructions to backup your existing data and import the matching First Class export file for that particular resource.